The 27.5″ tires highlights include good rolling, quick steering, durability, tough sidewalls, with a decent footprint and volume. 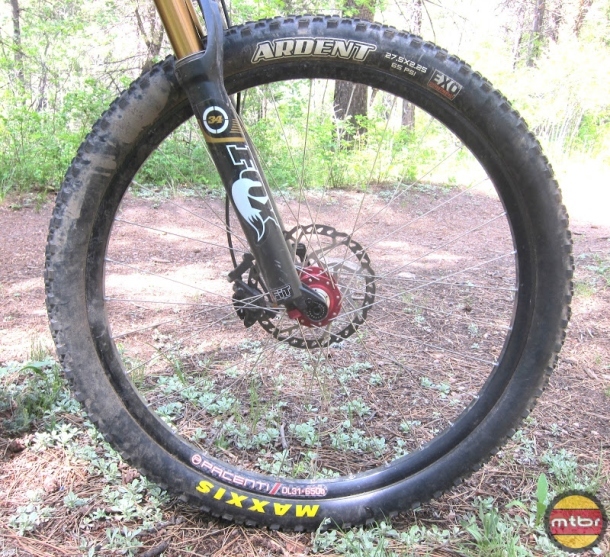 Maxxis Ardent in use on Pacenti DL31 rims on Ibis Mojo HD bike. Editor’s Note: An overview of the best Maxxis tires is available HERE. The Maxxis Ardent are a good all around and versatile tire, with low rolling resistance, a good footprint, which works well in a variety of terrain, with more emphasis towards drier conditions. The tires offer decent volume and weight, round profile, widely spaced knobs and great toughness with the EXO sidewall protection. The 27.5″ size is new for this product line, and is currently offered in only the 2.25″ width, in foldable and foldable EXO options, all with 60 tpi casings, and retail for $56 and $59 respectively. Although they’re not tubeless ready, they’re easy to set up tubeless on a variety of rims, and it didn’t take too much coaxing with a compressor to get them going, and they perform better in that mode than with tubes. The 2.25″ width puts them on the low side of the fatter tires, and they offer a decent-sized footprint and volume, while not being too large, which can be a great advantage when trying to fit 27.5″ tires into some frames, like my Ibis Mojo HD. When being run tubeless, the decent-sized volume allowed them be aired at decreased pressures, though if set too low, they did get squirrelly. Most of the time the volume is adequate and offers good cushioning, but when cranking up to higher speeds through rough rock gardens it gives a harsher ride than expected. It would be nice if they offered a 2.4″ version in the 27.5″ size, as the extra girth would add some much needed float, volume and footprint. Maxxis Ardent showing the tread pattern. The Ardent roll really well for a decently fat tire, and they snap up to speed with very little effort, sort of low resistance accelerators. That is a real advantage when working on some technical terrain, where instant jams onto the cranks can make or break a maneuver. They are also a joy when rolling along on undulating terrain, and less energy seems to be required to facilitate momentum. The dual staggered ramped center knob design along with the subtle angled ones on the shoulder accentuates this sense of acceleration and low rolling resistance. They had good traction in loose conditions and braked well, but I didn’t find them the best in wet conditions, where they felt a bit sloppy and slippery, especially on wet rocks. On rocky climbs and terrain, they had good pliability and adhered well to the conditions, though they didn’t feel sticky enough when you got them on steep rock ramps and slickrock. When cornering, I always felt like they gave a vague feeling, and would drift and washout like they had a mind of their own, which I found disconcerting and not at all confidence inspiring. Even when pushing them over past the transition of the shoulder to side knobs, it didn’t help the vagueness, though at least they did hook up better. When pushed hard into some good berms and rollers, they gave decent feedback, and they did have nice responsive and quick steering through terrain features. The deftness and steering capabilities were quite noticeable, and offered instant changes in technical and gnarly terrain, allowing one to steer just about anywhere. 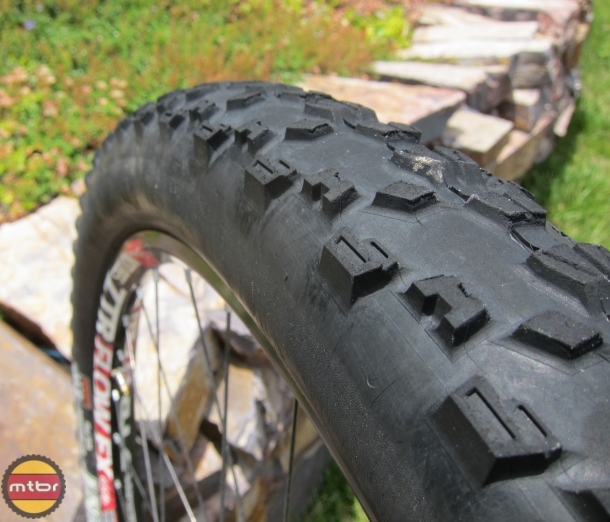 The EXO protection sidewalls, which offer increased abrasion and cut resistance, have been pretty tough, and work much better than the normal version, though I did end up tearing a sidewall when ripping down through some nasty rocky conditions. Another hallmark of these tires has been their durability, and even with my hard abuse in continual rock gardens and gravelly trails, the knobs haven’t torn off or worn out prematurely. The Ardent also comes in 26″ and 29″ sizes, in both 2.25″ and 2.4″ widths, in a variety of versions, including normal, EXO and LUST. 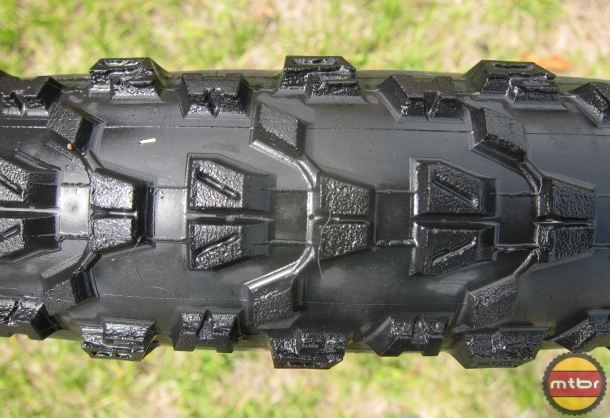 Maxxis Ardent – showing EXO sidewall protection and round profile. The all-around Maxxis Ardent EXO 27.5″x2.25″ had great rolling characteristics, and bounded up to speed well, and steered quickly and precisely through multiple types of terrain. They had decent stickiness, except on steep slickrock conditions, and overall had decent braking, good traction and rolling, though they lacked good deep cornering skills, with an uninspiring sense of vagueness. The tough EXO sidewall protection gave it nice robustness in rock gardens, and the tire has excellent durability, with no premature wear or torn knobs. Even with the decently sized volume and footprint, they felt somewhat harsh at speed when traveling through rough rock gardens. They preferred dry conditions, and weren’t the best in the wet, especially on rocks. Brian likes to push the limits in all the sports he obsesses in, whether it's mountain biking, whitewater kayaking, skiing, or sport climbing. He takes those same strengths and a good dose of insanity to his reviewing and writing on mountain biking products, creating technical, in-depth articles. Whenever he's not on the bike, he might be found watching MotoGP racing, otherwise look for him out on the trail. What was the test steed? I mounted the tires on the Pacenti DL31 rims on my medium Ibis Mojo HD with the FOX TALAS 160 (27.5″) fork. I am 5’9″, weigh in at 155 lbs, and I have mostly ridden in the West, including vast portions of the Colorado Front Range, Sedona, Moab, Fruita/GJ and many parts of the Colorado mountains. The testing terrain is predominantly loose rocky conditions, with many long steep climbs and descents, rock gardens, slick rock, an occasional smooth singletrack and lots of ugly, loose gravel. I tend to enjoy gnarly technical terrain, where precise steering and maneuvering are required and intricate follow-through, and full commitment is required. I have a 2.25r and 2.4f on my 29er set up tubeless and imho they’ve been pretty good all rounders here in the northeast. I’m sure there may be different characteristics between the different wheel sizes too. On wet rocks here they’re better than most and shed mud pretty well, of course if they made a sticky compound I’d be all over ’em. Tires are definitely a regional thing. Pea gravel? It might as well be ball bearings. There’s a lot of that at mountain creek and ski resorts. Then you need to rely upon skill level, body positioning and technique than blaming it upon tire choice.